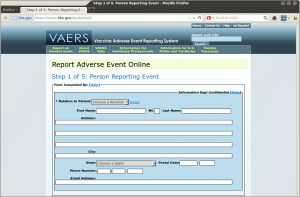 A screenshot of the VAERS online reporting tool. You are required to report all significant adverse events that occur after vaccination of adults and children, even if you are not sure whether the vaccine caused the adverse event. There are three ways to report to VAERS including online, by fax, and by mail. The online form can be found at https://vaers.hhs.gov/esub/step1 . You may also printout the VAERS form and fax it to (877) 721-0366 or mail it to VAERS, P.O. Box 1100, Rockville, MD 20849-1100. A pre-paid postage stamp is included on the back of the form. This page was last modified on 3 June 2013, at 04:29. This page has been accessed 8,475 times.